Santa getting ready to greet families with dozens of donated gifts during a “bonus” Christmas event. 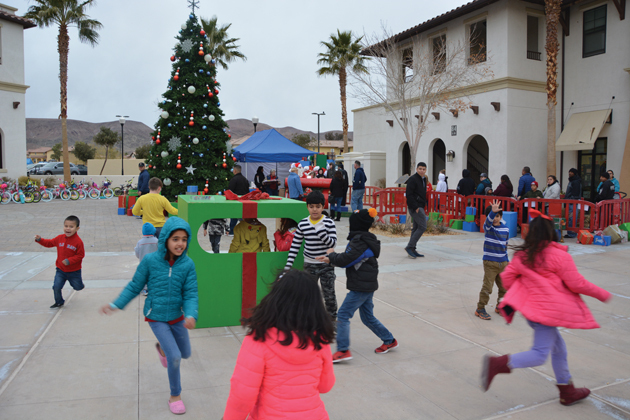 FORT IRWIN, Calif. — Hundreds of children were treated to a second round of treats and gifts during the 8th annual Christmas in January event, hosted by the Directorate of Emergency Services (DES). 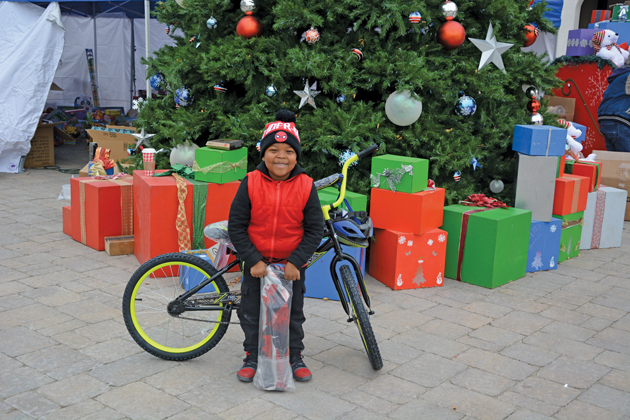 The event was held in Fort Irwin’s Town Square, thanks to the generous toy donations of the Leatherman Family and the great people at MOPAR, Red Cross, and the Rancho Cucamonga & San Diego VFW. Santa Claus, with a little help from DES, was able to spread joy and holiday cheer one last time before Santa returned to the North Pole to rest and recover from a very successful 2018 Christmas season. The event is more than just a great way to give the residents of Fort Irwin a special holiday experience, but also a great way for the DES to genuinely connect with the community they humbly protect and serve. Sgt. 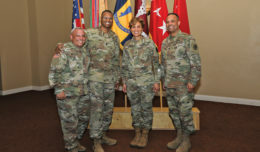 1st Class Simon Lopez, Operations NCO and Master of Ceremonies, played a pivotal role in coordinating and executing the event and said he felt, “The families of Fort Irwin know that the Garrison is here to support them and that their safety and wellbeing are a priority to us as a directorate.” As for the future of the event, Sgt. 1st Class Lopez really hopes other organizations will want to join in years to come, perhaps providing hot chocolate or carolers to the event to make it even greater than it already is. DES Sgt. Maj. David Sweeney is a veteran facilitator of the Christmas in January of the event and said, “I really enjoy going to the holiday event, meeting all the donors, and thanking them for their contributions and for everything they do.” He described the fundraiser and Christmas in January event as being very positive and says it’s inspiring to see people from the community come together for a phenomenal cause. 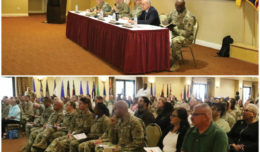 Christmas in January is a great opportunity to unite the Fort Irwin Military Community and partner with external nonprofit organizations to accomplish a very rewarding and meaningful community outreach. Ken Hammer, the president the Inland MOPAR Car Club, and Mike Keller, another key leader in the organization, made this event possible for the last 7 years by donating toys. “It’s great seeing the smiling faces of the kids,” Hammer said. 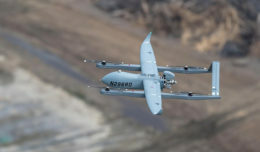 “To the club and ourselves, this event acts as a huge thank you to the Soldiers and personnel of Fort Irwin, as well as their families for everything they do”. As former Soldiers themselves, they fondly remember their time in “The Box” of Fort Irwin in the 1970’s. 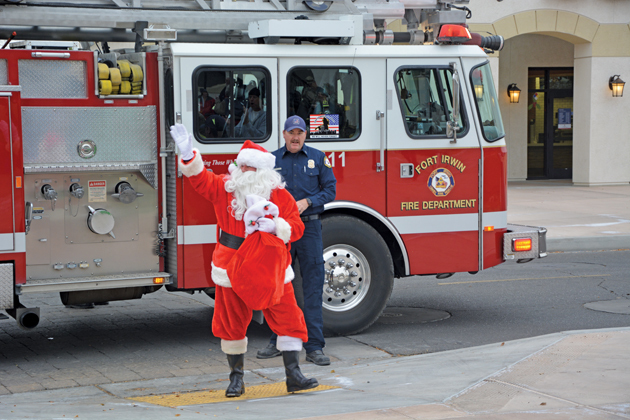 Fort Irwin Police, Guards, and Fire Department work with “grumpy” adults on a daily basis, who are not always mindful of whether or not they are being naughty or nice. Work for these personnel can be stressful and dangerous. The Christmas in January is especially useful in reintroducing Fort Irwin’s finest in a positive light. 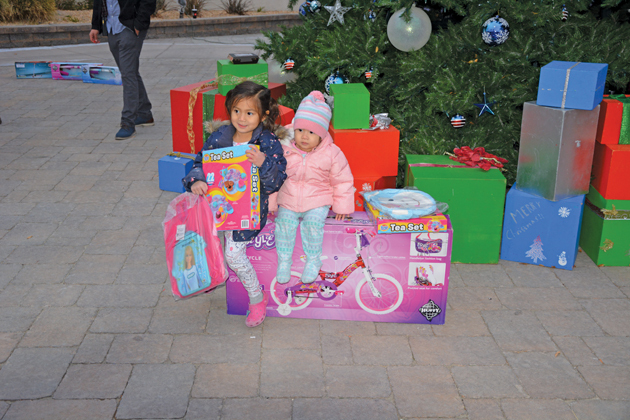 The event continues to make a positive impact on the lives of the Fort Irwin community. Through the combined efforts of many individuals working as one team, the event continues to grow, outdoing itself each year as a result of hard work, determination, and perhaps most importantly the goodwill that is so deeply a foundation of the holiday season. Many who worked this event in the past often come back each year. DES member Thomas Boggs and his wife Angie have volunteered for the Christmas in January event for the last eight years and hope to continue to grow its visibility. It is their hope that the event will continue to yield a higher turnout with each passing year. Kids had their pick of baby dolls, basketballs, board games, footballs and stuffed animals. More than 2 dozen bikes and 14 Razor Scooters were raffled off. 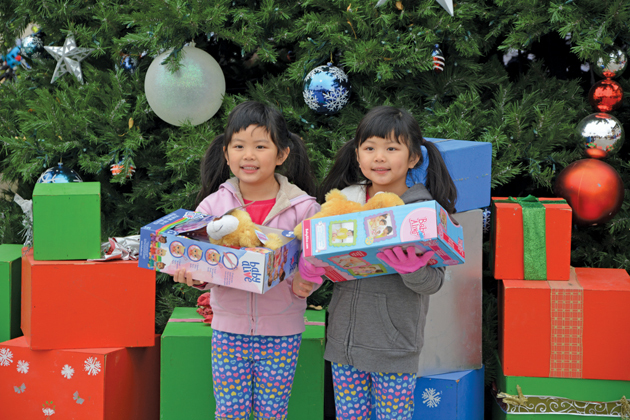 About 500 families showed up for the Christmas in January event. All children in the family were welcomed to receive donated gifts.